This topic contains 4 replies, has 2 voices, and was last updated by Ziggy 5 years, 4 months ago. I’m not really sure which update changed things (because I was on vacation for a while), but it seems like new problems have arisen in the parser. Take a look at this picture. Here’s the code if you want to try it for yourself. The spaces between the identifier and the : is confusing the parser. I’ll fix this for the next release. Cool. Oh, and did the issue with ‘mojo.LoadSound’ with the ‘LoadSound’ part not being colored also get fixed? 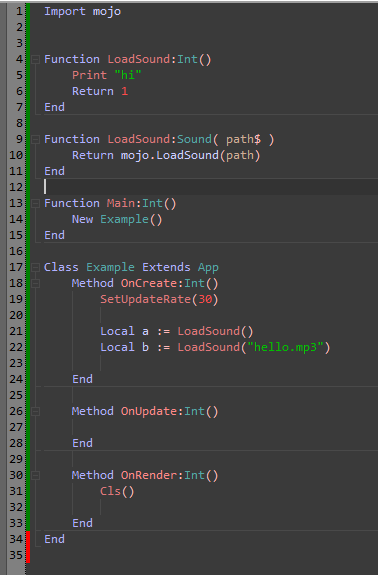 The LoadSound function is not defined in mojo but in audio wich is imported by mojo, so it should be audio.LoadSound. The compiler seems to make additional search when binding the identifier but not sure if adding this to the ide parser is a good idea performance wise. The topic ‘FIXED: New := problems and module parsing issues’ is closed to new replies.